I've been behind on this project for a couple weeks, but making progress. In this episode, I demonstrate a quick way to remove your existing vanity! :) We'll prop up the top on the wall to take some measurements that will determine the sizes (depth) of the drawers taking in account the plumbing obstacles. Plus it was motivating to see the top hanging off the wall! We'll resaw and dimension the stock for the drawers and end with a discussion of the whole "wet the board and tent it" technique that I've been using throughout this series. Some questions came up about it after the sculpting episode so I thought to better explain it here. While this episode gets a few loose ends in order and prepares the drawer stock for joinery, the actual drawer joinery is the next episode. That episode will be a set of smaller videos showing a number of ways to dovetail drawers. I haven't had as much time in the shop as I'd like, but today I needed a break from the day-job... and it was nice out! As the latest sculpting video for the Mahogany vanity explained, the embossed coral pattern will get lowered so as not to be too proud of the surface as well as some accenting to give more depth and spatial relation to the parts. A big factor in deciding what to do is to stop and look at the three panels in relation to each other. If you remember the last scene of the latest podcast, the three panels were side-by-side. Some of the coral growths that spanned panels looked like they took an abrupt redirection. That was due to looking at them flat; I drew the side panel patterns free-hand with the panels clipped to the vanity bottom so those abrupt changes actually flow correctly in-situ. Looking at them in-situ and from above is the normal way it will be viewed. What looked like stark shadow lines that I didn't want when viewed at eye-level actually look correct when viewed from above at a steep angle. There's going to be a bit more shaping, but the vast majority of it is done. The channel down the center is for the drawers and hasn't been sanded in the least, as the color suggests. That part will be shaped when we address the drawers. From the podcasts, you know that I've been wetting the panels and storing them under weights in a humidity tent to keep them flat. So far, so good. When I spray them down, the chatoyance of the Mahogany really comes out and mutes the undulating patterns that are more stark here. It's a contemporary project, for sure, but I like those. If you're not into contemporary stuff, there will be some interesting work on the drawer fronts later that you could use in your own creations, but that'll be after I remove the old vanity and prepare the plumbing... I need that partially done in order to determine the drawer sizes. A couple minutes ago, the all-time reads of this little blog reached a nice milestone: 100,000 lifetime views. Thanks to all of you for reading! 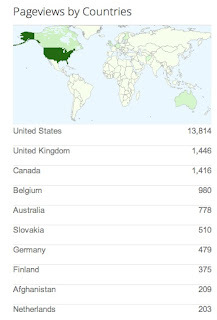 I do have to say that "all of you" is actually an interesting mix of worldwide readers. 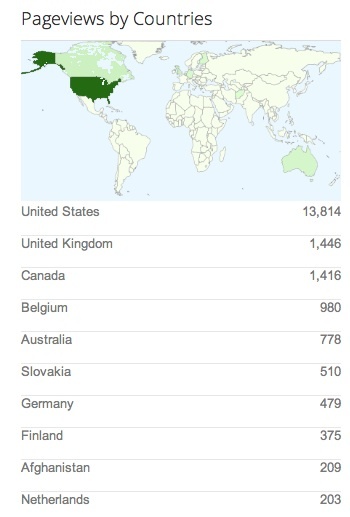 This table is from the past month's worth of readers; nice to see a lot of countries chiming in. For those who don't know me personally, the majority of my friends are foreign-born from most every continent, except Antarctica. That said, though, I'm sure I could befriend some Emperor penguins with a bucket of fish. Seeing the numbers for Germany, one of the best comments I received on a video was from a German gentleman who said "why is a German in Germany reading a blog from Arizona to learn about his German tools!" I dunno the answer, but glad he's here! So it is difficult to know when I started this blog. Oh, it started back in May 2009, but it had 1 or 2 entries for months. I got more serious about it near the end of 2010 although the stats show some interest in August 2010 so I'll call August the start of it. Nearing a first year of blogging in earnest. Lastly, the videos over on the YouTube channel are nearing the 75,000 mark. I started the channel January 24, 2011 so also nice to see progress there. Sculpted Mahogany Vanity - Sculpting! Finally getting to the sculpting! In this episode, we transfer a pattern I drew to the panels then mark them for pre-sculpting. The pre-sculpting is done with a router so I took the opportunity to give you a side-by-side view of the OF-1400 vs the OF-2200 each working a panel. The dust collection on both is fantastic. Then comes the sculpting of each panel. In real-time, each panel took close to an hour depending on the complexity. I won't put you through watching an hour of sanding :) The clip is about 4 minutes to highlight certain aspects of the shaping process. I have a couple tips to share about using the RAS-115 and RO-90 at the end that get demonstrated. Lastly, you get to see the three panels side-by-side in a fairly rough state; the embossing will be lowered considerably, but I talk about some effects I can use while they are still pronounced. This week, I'll work on removing the old vanity as I need to get any plumbing changes done first before planning the depth of the drawers. My neighbor (my plumber) has been out for a week so I'm behind on this! Once the drawer sizes are decided, we'll go through doing those. In spare time (!!) I'll complete the shaping of the panels as they won't be needed until after the drawers are built. In the video, I mention using Iwasaki rasps and plane files. I got some of mine through Highland Woodworking. D'oh! I shouldn't have gone there to get the link... there are so many more I'm interested in for other projects :) Even if you don't plan on shaping anything, I'd recommend getting a set of the very fine files. With the flat one, you can adjust tenons very quickly, clean mortise sides, and any number of other 'flat' corrections. You'll be impressed by how they cut. Now earlier this week, someone on the FOG had some questions about handling the RO-90 especially in rotary mode. They wanted to see some raw footage basically so I took the raw footage of sculpting, removed the RAS-115, and sped it up. Are you an insomniac? This is the cure! Again, it is raw footage so just me sanding with the RO-90 for 8 minutes... the tune is good, though! I recently got a Laguna Tools Italian-Made LT-18 bandsaw. There's a 4-part video review of it if you are interested. The one thing that bugs me, though, is that the dust collection is really bad since it doesn't have an under-table port. In this video, I discuss how to modulate your DC's air flow to a shop-made shroud for cleaning right under the table. The results were very good; not dust-free, but very good. While I did this for my Laguna Tools LT-18, the modulation method and some ideas on how to build the shroud can carry over to your bandsaw. Frankly, I wish I did this on my Rikon 14" I owned previously. Not the most interesting topic, I know, and certainly the video could use some bikinis (not on me...) but it should give you ideas on how to make your bandsaw reasonably dust free. If you have a great dust collection idea for bandsaws, please post it in the comments.